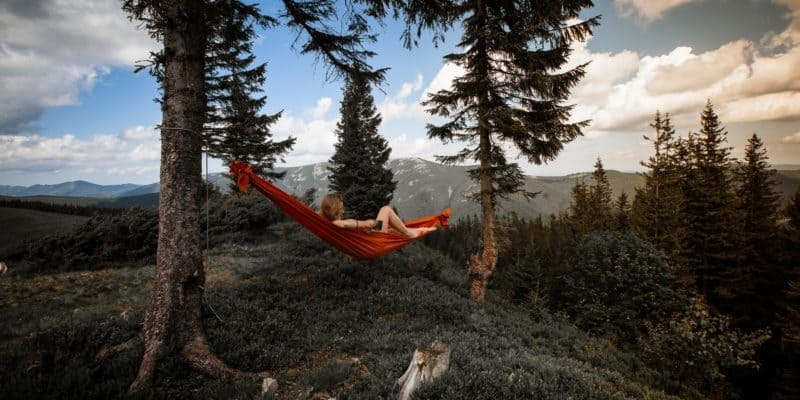 In this article, we’ve compiled a list of the Top Ten Camping Hammocks of 2019. With so many great outfitters providing hammocks today, we recognize that choice overload is a real possibility. That’s why we’ve also included a comprehensive Buyer’s Guide and a Frequently Asked Questions section to give you the information you’ll need to select the right hammock for your intended uses. The Kammok Roo Double has been redesigned for 2019. The latest version is lighter, stronger, softer, and more breathable than previous models. For those that need the flexibility to go wherever adventure beckons at a moment’s notice, this camping hammock sets the standard for elevated camping. The material of this hammock is 40-denier Gravitas™ fabric. When it comes to strength to weight ratio, this fabric can’t me matched. You’ll be able to hang safely in the Roo Double with up to 500 pounds using Kammok’s climbing grade suspension system. As for weight, the 2019 version is 20% lighter than last year’s model and weighs a total of just 18 ounces. Like most hammocks, the Wise Owl SingleOwl is designed to help you fall asleep faster and sleep more comfortably through the night. It’s a great hammock choice for anyone who’s tired of sleeping on rocks and roots in their tent. This hammock uses 210T (1) parachute nylon that’s capable of supporting a maximum weight load of 400 pounds. The Wise Owl SingleOwl is designed with triple interlocking stitching to give the seams superior strength. When unpacked, the hammock measures 9 feet long by 4.5 feet wide. When packed, it’ll fit in a 5” x 5” space in your pack. Overall, the SingleOwl weighs just 16 ounces and comes in a drawstring stuff sack. Additional items include two 8-foot nautical grade nylon ropes and two steel carabiners for hanging. Made by Oak Creek Outdoor Supply, this camping hammock is a great choice for travelers, hikers, campers, or those that simply want to hang it in the jungle and marvel at the diversity of species in the trees overhead. It’s made with ultra-strong, tear-resistant parachute nylon with reinforced stitching and knotting. In total, the Lost Valley camping hammock can support weights up to 350 pounds. With a single drawstring bag, the hammock and its accessories pack up to be portable and lightweight. 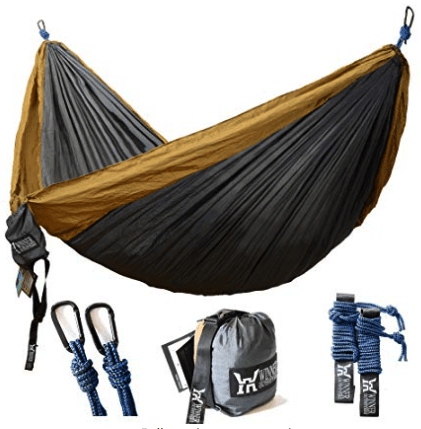 The whole bundle, which includes a hammock, rain fly, bug net, two tree straps, two steel carabiners, two stakes, and two guy lines, weight less than four pounds and can be set up in less than three minutes! With enough space for two people to sit or lie down comfortably, the ENO DoubleNest is the ‘Palace in the Sky’ of camping hammocks. It boasts so much space that it can sometimes feel awkward to sleep solo in it, but it can still be easily packed into its attached compression sack to be conveniently stored in your pack. The ENO DoubleNest sets up in seconds. It includes heavy duty triple stitched seams and is made of soft, breathable, and fast-drying material. The hammock’s 70-denier high tenacity nylon taffeta (2) can support weights up to 400 pounds. The hammock itself weighs just 19 ounces and offers of dimensions of 9’4” long by 6’2” wide. At either end, the hammock features aluminum wiregate carabiners for secure attachment to tree straps. The Winner Outfitters Double Camping Hammock is another great selection for hikers and backpackers, but it’s also a great option for hanging in your backyard or on a day trip to the beach. The hammock material is durable 210T nylon that can support weights up to 500 pounds. But it’s also soft and breathable to keep you comfortable and cool for your lie. The hammock’s material is also resistant to fading, even when exposed to sun and rain. This camping hammock offers total dimensions of 118” long and 78” wide. It weighs just 2.5 pounds when packed up and comes with polyester straps and carbon steel carabiners. These carabiners feature an E-coating surface that makes them smoother and more resistant to scratches. When you’re searching for a durable and lightweight hammock, it’s hard to overlook the Ultralight Single Plus from Hummingbird Hammocks. This hammock is actually built to FAA parachute rigging standards (3) and weighs just 7.6 ounces when packed up. It’s also certified open hardware (4), which means it meets a uniform and well-defined standard for open-source compliance. The Ultralight Single Plus is made of PIA-C-44378 T4 Certified reserve parachute fabric, nylon plastic, 1500-pound Spectra (5) cord, and military-spec bonded nylon thread. It can support weights up to 350 pounds and boasts unpacked dimensions of 9’8” long by 5’3” wide. The entire bundle includes the hammock, attached stuff sack, and attached button link carabiners. For those that live in heavy mosquito country, the Grand Trunk Skeeter Beeter Pro is an excellent hammock choice. There’s nothing worse than climbing into your hammock and being tormented by those little flying nuisances. But with the Skeeter Beeter Pro, the attached bug net will keep you bite-free and allow you to get a solid night’s rest. This camping hammock is made of 210T parachute nylon with triple-lock stitched seams and No-see-em, nylon mosquito netting. It boasts a double-sided zipper for easy entry and exit and the material is soft, breathable, and fast-drying in case it gets wet. The whole hammock bundle features two nautical grade carabiners, a starter rope kit, suspension cord, and stuff-sack for stress-free travel. If you’re looking to slack off in style, it’s hard to beat the Therm-a-Rest Slacker Single Hammock. This hammock’s soft polyester fabric feels great on your skin and provides a subtle stretch that virtually eliminates all pressure points in the nylon. The attached stuff pocket is a great place to keep a book, phone, or water bottle as you relax under your favorite tree. This camping hammock is made of 100% ripstop polyester, which dries much faster than nylon. Its one-piece design adds another layer of comfort while boosting the hammock’s overall durability. It can support weights up to 400 pounds and features ultralight aluminum carabiners for easy hanging. In total, the hammock weighs just 18 ounces and packs up to fit in a 7” x 10” space. The Hennessy Hammock is known to some as “the hammock that started the hammock camping revolution.” With its patented asymmetrical design and structural ridgeline, it’s truly made for comfort, regardless of the spacing between trees. It’s an excellent all-purpose hammock for backpacking, family camping, expeditions, kayaking, and much more. This camping hammock is made of 70-denier high-density nylon taffeta that can support weights up to 250 pounds. The rain fly is made of 70-denier polyurethane-coated ripstop polyester and the bug net is made of 30-denier polyester No-See-Um netting. The hammock offers dimensions of 120” by 59” and a packed weight of two pounds, 12 ounces. The Sub6 is Eno’s lightest hammock. It is designed to embody the spirit of ultralight backcountry camping and boasts an impressive 5.8-ounce body. Although it is one of the lightest hammocks on the market, the Sub6 still retains impressive strength and security. It has the ability to support weights up to 300 pounds. This camping hammock is crafted from lightweight 30-denier ripstop nylon and Dyneema® fiber (6) that is stronger than steel. It also features new aluminum toggles and combines with the Helios Suspension System to offer the same ease of set up you’ll find with a traditional hammock. When packed up though, the Sub6 fits well into small spaces so that you can go light and move fast. The use of hammocks dates back more than 1,000 years and their origin can be traced to the Mayans of Central America. The hammocks of those days were most likely woven from bark or plant fibers, but their practicality quickly made them widely used throughout Central and South America, as well as in Mexico. Today’s hammocks are arguably more practical and easy to transport than ever. With advancements in materials and fibers, manufacturers are able to make hammocks that are both extremely durable and exceptionally light. In order to help you sort through the many great options out there, this Buyer’s Guide will focus on several key factors to consider when buying a new camping hammock. The first thing you’ll want to think about is whether you want a hammock to fit just one person or that gives you the ability to sleep two. If you’re a larger individual with broad shoulders, for example, you’ll probably want a “double” hammock even if you’ll be the only one sleeping in it. When you hang your hammock, the last thing you want is for it to be pinching your shoulders toward each other when you climb in. For this reason, it helps to go slightly larger when it comes to comfort. The caveat is that you’ll add a little more weight, but when it comes to getting a good night’s rest, the added weight is usually worth it. Because the most comfortable way to sleep in a hammock is actually diagonally, some extra width will help you get cozy in your new hammock. When it comes to length, most of the hammocks on the market today are in the 9-10 foot range. This is designed to leave plenty of extra space at the head and feet of even the tallest individuals. Keep in mind, however, going with a longer hammock means you’ll need more space between anchor points in order to achieve a favorable hang. The main reason you want to consider overall weight is for carrying purposes. Today’s hammocks are extremely useful for ultralight backpacking and camping. In these scenarios, most ultralight hikers and backpackers measure their pack weight down to the tenth of an ounce. But when you’re talking about covering 30 or more miles per day, for many days in a row, those extra ounces can add up to extra wear and tear on your body. Fortunately, most hammock manufacturers know that their ideal audience wants their hammock to be light. Because of this, you can find the overall weight of a hammock easily advertised before making a purchase. On the other hand, those of you that prioritize protection from the elements overall weight reduction will be less concerned with overall weight and more tuned into the rain fly and bug net quality of a given hammock. Because the most important part of enjoying a night in a hammock is how you hang it, it’s important to pay attention to the type of straps you’re getting (or will need to purchase) with a given hammock. Straps will make or break (quite literally!) your hammock experience, so you want to spend some time to make sure you’re getting quality. There are a variety of ropes and straps out there to help you hang your hammock. Ideally, you want to find straps somewhere between 6 and 10 feet long. Nylon tubing is a great material for hammock straps, and you want to look for straps that can support upwards of twice your body weight, just to be safe. Some hammocks that are frequently used by rock climbers need steel screws or mounts that attach to the rock face before you can hang the hammock in place. But for those of you that plan to hang your hammock from trees, the best straps wrap around the outside of the tree without any insertion points, so that you don’t damage the bark. Straps that are at least ¾ of an inch wide will be much less likely to damage trees than thinner straps or rope. When you’re comparing one hammock to another, you’ll also want to look at the accessories that are (or aren’t!) included in the ‘hammock bundle’. As I mentioned briefly earlier, some hammocks are sold a la carté and you’ll need to purchase straps, a bug net, a rain fly, and anything else you need to complete your hammock set-up. When you’re just starting out, it’s both beneficial and economical to choose a bundle that includes everything you’ll need to get started. Unless you can say with certainty that you’re not going to see a drop of rain during your camping trip, you’re going to want a tarp to go above your hammock. Unless it’s nearly the end of fall and mosquitoes are a complete non-factor, having a bug net to put up just in place is really convenient. With that said, if your intention for buying a new camping hammock is to have a place to relax during the day before retreating into your tent after night falls, then there’s no need to have all the bells and whistles that come with a full hammock camping set-up. Make sure you know your intended use before you overpay for a full set-up that you don’t really need. There are certain best practices that will help you get the most out of your hammock’s performance and also enjoy your hammock camping experience to the best of your ability. In this Frequently Asked Questions section, we’ll answer some of the most common concerns and inquiries about hammocks and hammock camping. What is the most comfortable position for sleeping in a hammock? Experienced hammock campers will pretty much universally tell you the same thing. For the best night’s sleep in a hammock, you should sleep at an angle. This minimizes the amount your back bends. To achieve an optimal sleeping position in a hammock, angle your body about 10 to 15 degrees away from the centerline of your hammock. What should I look for when it comes to trees to hang my hammock from? Too many novice hammock campers make the mistake of hanging their hammock from what we like to call “widow makers.” These are old trees with lots of dead branches. Even if they look like they’re still sturdy enough to hang from, avoid them! Don’t even camp underneath them. Instead, look for healthy trees that are at least 8 inches in diameter. Ideally, the tree doesn’t budge much at all once you’ve wrapped your strap around it and you give it a firm tug. If the tree sways a lot, find a new place to anchor your hammock. Remember that you’re going to be hanging there all night! How should I hang my hammock straps? Once you’ve found a couple of trees that you’re sure will support your hammock, tie your straps at about a 30-degree angle. When your hammock is attached to the strap, the acute angle between the strap and the attachment point (if you were to draw a straight line from it to your anchor point) should be about 30 degrees. When you achieve this angle, you’ll find that you can get comfortable in your hammock without your back bowing uncomfortable. If you’re unable to achieve this optimal angle, you can always go steeper, as it’s usually more comfortable with more sag, rather than a straight, rigid set-up. Will any old carabiner do when hanging my hammock? No! We’ve seen way too many folks fail at their first hammock set-up because they didn’t choose the right carabiners. Fortunately, many hammocks come with their own, but if you have to replace them or choose your own, make sure the carabiners you choose are climbing grade and rated to support the appropriate amount of weight (7). Lightweight wiregate models are almost always an excellent choice for hanging a camping hammock. Certainly beware of the cheap variety packs you’ll find at a local hardware store. If it says ‘Not For Climbing Use’, then it’s ‘Not For Hammock Use’ either. What are the major differences between hammock camping and tent camping? Well, for starters you’re up off the ground. Perhaps the most important difference is in airflow. In a hammock, you’ll be exposed to more wind and air movement throughout the night than you would be in a tent. If you’re hammock camping in hot environments, you’ll actually welcome this added airflow. But if you’re camping in a colder climate, you’ll want to bring along an underquilt or pack a heavier sleeping bag when hammock camping. Typically, the underside of your hammock is where you’ll need added insulation. How can I wash my hammock? Like most of your gear, the exact recommendations for washing your hammock will depend on the hammock’s manufacturer. Many hammocks can actually be machine-washed, but you’ll need to be careful to remove any metal carabiners or other items before placing them in the machine. Most manufacturers also recommend air-drying your hammock on a breezy day, as the heat of a dryer can compromise the hammock’s material. Most hammocks can be cleaned with mild detergent. Bleach should always be avoided. But, as I mentioned, be sure to consult the exact recommendations for cleaning from your hammock’s manufacturer before starting the process! There are actually many amazing benefits of sleeping elevated in a hammock. For our money, it’s hard to beat being rocked to sleep by a gentle breeze as you gaze up at a sky full of stars on a clear night. We hope you’ve enjoyed this review of the best camping hammocks of 2019 and we wish you the best of luck choosing the right hammock for a quality hang!